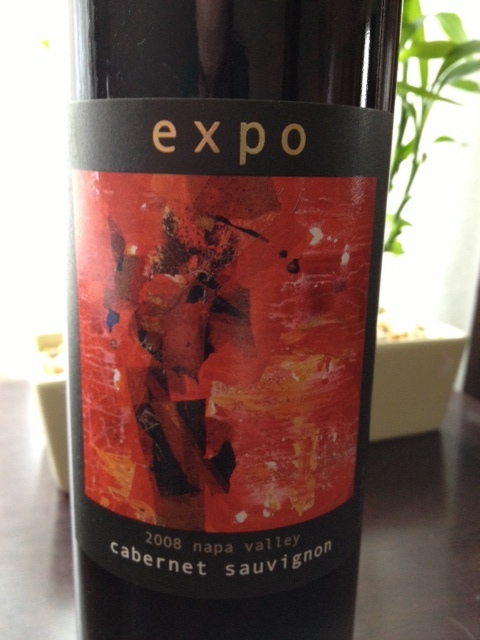 2008 Expo Cabernet Sauvignon, Napa Valley, California, USA. Featuring artwork by Carol Schinkel of Fort Collins, CO.
Second tasting of the 2008 Expo Napa Valley Cabernet Sauvignon. I’m really a fan of this Cab and trying to think of a way to explain in simple terms: On a day where you are reluctant to break out a proven superstar but are looking for some grapes that bring it, the Expo is a great option. It’s not a home run, but it’s a solid double into the gap and you’re looking to advance. The Expo kind of has a boutique feel to it and was paired last night with a killer green salad and pan-seared steaks. The fresh ground pepper on the salad, combined with the red meat, seemed to bring out some of the flavors (dark reds, spices) of this great cuvee. Since I cheated a glass from this bottle earlier in the week (a great, heart-healthy after-work drink, incidentally), I was about one short last night but am already looking forward to the next taste. This entry was posted in Cabernet Sauvignon and tagged alison crowe, california winemaking, napa valley cabernet sauvignon, USA.